DML now has continued with their new series of German midwar armored vehicles with zimmerit pase surface molded in place by doing the early version of the Tiger Ausf. B with the Porsche turret; although only 50 were built as opposed to 435 with the Henschel turret, many modelers have preferred the lines of this version of the tank. Up front I have to say that this is the first kit I recall when DML has pulled a fast one on modelers and reviewers: the kit uses the exact same boxart as the 1/72 scale Armor Pro version (No. 7254) of the same vehicle! I have not made an error with the attached box art with this review, as it is verbatim other than the standard box art presentation format for each scale. So far comments from modelers have shown this is a very popular decision on the part of DML to offer pre-zimmerit coated models. As I thought originally, only the old liners have complained about it (the modelers who "broke the code" how to apply a realistic zimmerit paste finish to their models) but some of their comments are valid. One problem that does arise is thte fact that the kits offer no purchase for the brass parts used for track hangers and other OVM attachment points with the exception of the hull sides, which come with flat smooth spots for attachment. This means the modeler will either have to fill or smooth the turret locations or use epoxy or a very thick ACC type cement to get the brass parts to attach. That being said, this kit follows the previous Henschel turret one (No. 6303) and uses the improved parts for their "Premium" kits of the Tiger II with newly molded bits and their generic accessory kits for German vehicles. This kit exchanges fewer parts as it has a much simpler turret and fittings than the Henschel one. Parts replaced include the upper hull, the turret shell, the hull rear plate, the machine gun ball mount for the glacis, the lower glacis, the turret rear hatch (two options), and the turret glacis. Note that while the directions indicate the regular hull and turret shell come in the kit, they have been "gated off" and removed from the sprues. 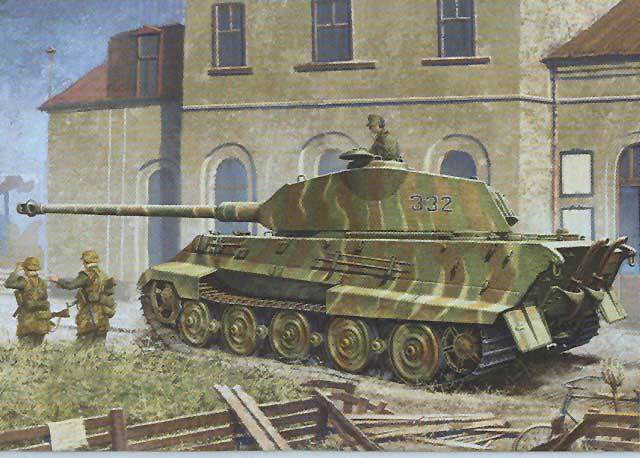 The remainder of the kit provides for a Tiger II with Porsche turret with the "normal" steel road wheels, "Magic Track" pre-trimmed two-part single link track (toothed links and plate links), a slightly smaller sheet of etched brass for the screens and detail parts, and a complete set of the "T" series recently molded German tools and OVM. The ones provided are as follows: TA - pioneer tools and a fire extinguisher; TB - jack and cable hooks; TC -tow cable heads; TD - auxiliary cable heads; TF - 8.8 cm muzzle brake for aluminum barrel; TG - self-defense projector weapon; TH - hatch braces; TJ - turret AA MG ring mount; TL - armored exhaust shrouds; and TK - bow machine gun mount. It also comes with an aluminum gun barrel with "slide molded" muzzle brake. Alas, like the Henschel version of the zimmerit kit, this one regretfully uses the "Color Photo" version of the DML directions, using a pre-painted or primed version of the kit, which makes it far more difficult to determine the correct location of parts as it shows them installed and not when or how to install them. However, it does now include "cartoons" or line drawings showing specific details of some of the brass fittings, which is a step ahead over past renderings in this fashion. The kit provides a total of six different finishing opitions: 3/s.Pz.Abt. 503, Mailly le Camp, 1944 (tricolor stripes, black 332); s.Pz.Kp. (Fkl) 316, France 1944 (sand, white 13); s.Pz.Abt. 506, Arnhem 1944 (sand and green patches, no number); unidentified unit, Eastern Front 1944 (tricolor patches, red 332); s.Pz.Abt. 503, Normandy 1944 (tricolor stripes, black 113). 3./s.Pz.Abt. 503, Hungary 1945 (whitewash with black 314); most of these are identical to the offerings in the 1/72 scale "baby brother" to this kit. There is a relatively large sheet of targeted Cartograf decals provided for these options. As with previous kits, project supervisor is Hirohisa Takada; technical drawings by Minoru Igarashi; and technical consultants are Tom Cockle and Gary Edmundson. Overall this is a brilliant idea and now the Tiger fans have a choice between the two Tiger II production models with pre-applied zimmerit.